Asthma is a chronic lung disorder that can make breathing difficult by narrowing and inflaming the airways (bronchial tubes). “Asthma” is an ancient Greek word meaning “short breath, panting.” One of the telltale signs of asthma attacks is the wheezing and breathing difficulty that they cause. About 25 million people in the U.S. have asthma; 7 million of those are children. Asthma reports are on the rise. The condition affects men and women equally. Asthma causes over 14 million visits to doctors each year and nearly 2 million visits to emergency departments. 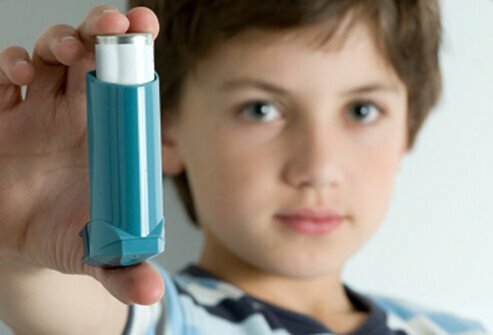 an increase in the number of people with asthma. African Americans are about three times as likely to die from asthma as white Americans. 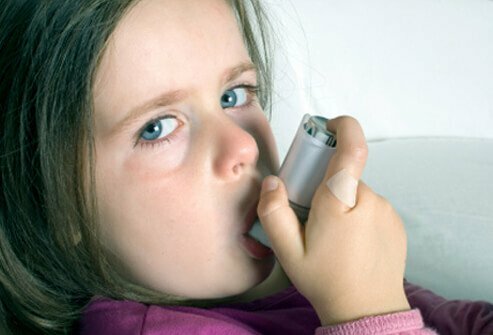 Most people who die from asthma are over age 50, but children sometimes die of the condition, too. 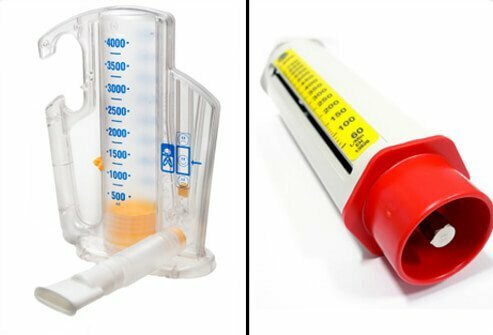 Asthma inhalers and nebulizers have advantages over oral medications and injections in that they deliver medicine directly to the airways. 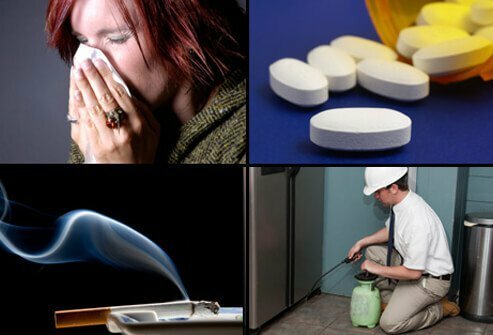 They also have fewer side effects than other forms of asthma medication. Metered Dose Inhalers (MDI): MDIs are the most common type of inhaler. They spray medicine from the inhaler like an aerosol can. Dry powder inhalers: Dry powder inhalers deliver a powdered medicine that does not spray from the inhaler. Instead, the user must breathe in the medicine quickly and forcefully. Sometimes MDIs are used along with a device called a spacer. Spacers help coordinate breathing with the release of the asthma medicine, and also make the droplets of medicine smaller, making it easier to breath them in. For babies and very young children, an inhaler requires too much work. In that case, a nebulizer can be used. Nebulizers are powered by electricity to turn asthma medicine into a fine mist. The mist is delivered through a tube attached to a facemask or mouthpiece. 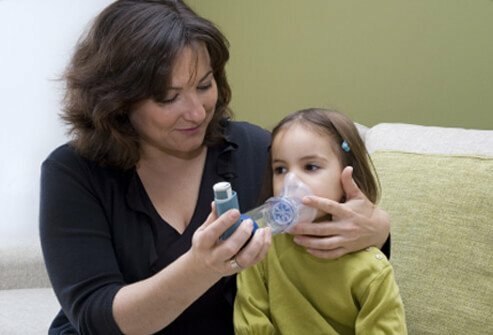 Disadvantages to nebulizers include the fact that they can be noisy, they can be big, they can be time-consuming, and they may not be very portable. Inhaled Corticosteroids: Inhaled corticosteroids reduce inflammation in the airways, which reduces swelling and tightening. Sometimes these medicines are used even without asthma symptoms, as they can help prevent future asthma attacks. Types of inhaled corticosteroids include beclomethasone, budesonide, ciclesonide, flunisolide, fluticasone, and triamcinolone. Short-Acting Bronchodilators: Bronchodilators have no steroids and work by relaxing the tiny muscles that can tighten airways during asthma attacks. 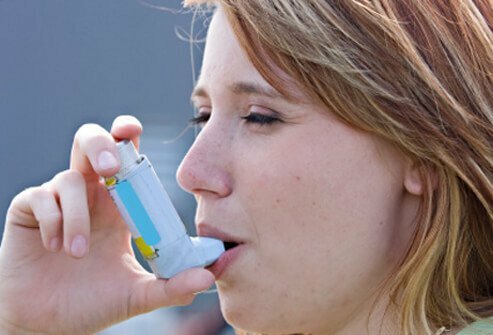 Short-acting bronchodilators give quick relief to asthma symptoms. Types of short-acting bronchodilators include albuterol, levalbuterol, terbutaline, and ipratropium. Long-Acting Bronchodilators: Long-acting bronchodilators are taken daily to help control asthma and prevent future asthma attacks. Types of long-acting bronchodilators include salmeterol and formoterol. The Respiratory System: What Is Respiration? Respiration is how our bodies allow oxygen in, and also how our bodies releases carbon dioxide. When we inhale, air passes into our windpipe (trachea), our diaphragm contracts and moves downward creating air space in our chest cavity. The air enters the lungs, passing through the bronchial tubes and finally to the air sacs (alveoli). Oxygen from the air passes from the alveoli and into the bloodstream through tiny blood vessels called capillaries. Capillaries deliver this oxygen-rich blood to the pulmonary veins, which go to the left side of the heart. The heart then pumps the oxygen-rich blood to the rest of the body. When you exhale, air that is rich in carbon dioxide (CO2) passes out of your lungs, through the windpipe, and out your nose or mouth. The main cause of narrowing airways in asthma is inflammation, which makes airways more swollen and sensitive. When airways are inflamed, air has a smaller space to pass through. In addition, the muscles surrounding the airways may tighten during an asthma attack, further narrowing the space for airflow. 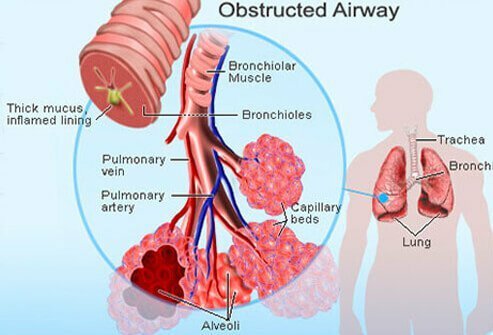 When airways react to inflammation, they also produce more mucus, which is a sticky and thick liquid substance that can clump together and narrow air passages even further. Moreover, certain allergy and inflammation cells (eosinophils and white blood cells) accumulate at the site of the inflammation, causing tissue damage and even more narrow airways. This chain reaction causes the breathing difficulty associated with an asthma attack. The lungs are made up of tubes that branch out like a tree. They become smaller and smaller as they enter the lungs, eventually becoming so small that they become microscopic. The larger tubes that split off from the trachea into the lungs are called bronchi. During an asthma attack, people may experience bronchospasm, where the bronchial tubes tighten and further narrow the airways. Coughing and wheezing may be symptoms of bronchospasm, and bronchospasm can occur when the airways are irritated by cold air. Bronchospasm can happen suddenly. It can be treated by medicines called bronchodilators. People with asthma may become hyperreactive (hypersensitive) to certain inhaled allergens or irritants. These are called triggers, and these triggers can cause even more inflammation and narrowing of the airways. The reason for this is that some people’s bodies are immunologically inclined to overreact to certain substances. An overactive immune system can set off asthma in this way. But exactly what substance may cause such a reaction varies from person to person. In the next three slides, we’ll review in more detail about asthma triggers. 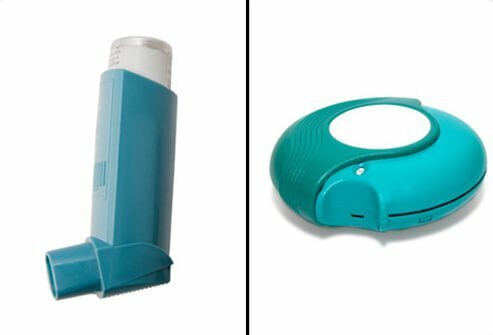 Which Triggers Cause an Asthma Attack? Things that can cause an asthma attack are referred to as "triggers." Not everyone with asthma has the same triggers. 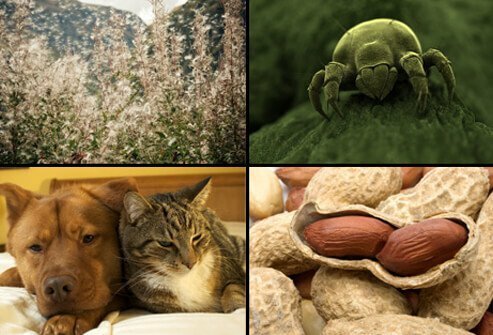 Triggers can be either allergens or irritants. People with asthma need to learn what their triggers are so the triggers can be managed or avoided altogether. Recognizing and avoiding your triggers can help you prevent further asthma attacks. 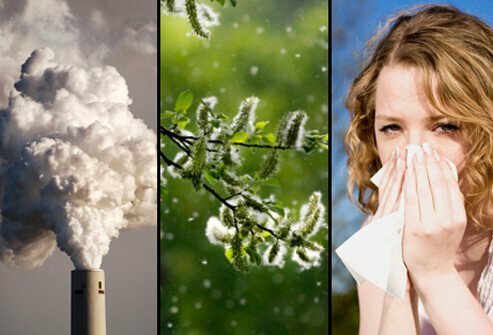 Allergists and immunologists are medical doctors who specialize in helping patients identify irritants and allergies that cause problems like asthma. They can help you develop a plan to avoid asthma triggers and feel better more consistently. Asthma seems to have both genetic and environmental causes, and can develop at any age. However, asthma does tend to start in children ages 2-6. At this age, asthma is triggered by allergens such as dust mites, tobacco smoke, and viral upper respiratory infections. Adults can also develop asthma, and only about 30% of adult asthma triggers are related to allergies such as pet dander, mold, or dust mites. Risk factors for adult-onset asthma include being female, obesity, hormonal fluctuations such as those experienced during or after pregnancy or menopause, and viral or other infections. 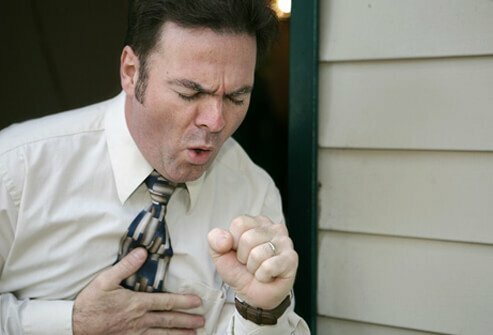 Allergic (extrinsic) asthma is that which is triggered by an allergic reaction. It is an immune system response to an irritant. This is the most common form of asthma, affecting more than half of all sufferers. It can often be managed with medication. Non-allergic (intrinsic) asthma is caused by factors other than allergies, such as exercise, stress or anxiety, inhaling cold air, smoke, viral infections, and other irritants. This type of asthma is less common, it develops more often in adults, and is more difficult to treat than allergic (extrinsic) asthma. Not everyone with asthma will experience all symptoms, and the severity of symptoms can vary depending on the individual—even in an individual they may vary over time. 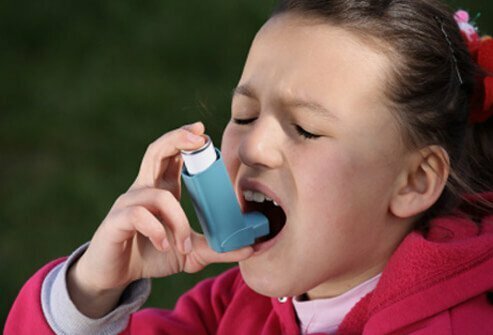 Many times asthma attacks can be controlled with inhalers (inhaled bronchodilators). If that is ineffective, the patient should call 911 or be taken to an emergency room immediately. When asthma does not respond to initial treatment it can result in a life-threatening reaction called status asthmaticus. 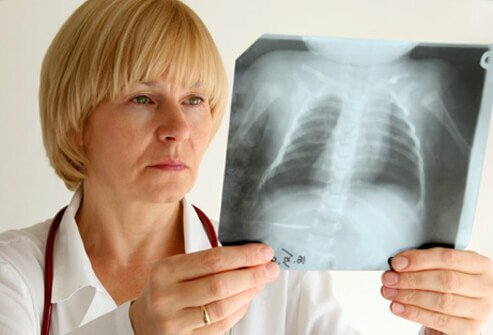 chest x-rays or EKGs to find out if a foreign object or another condition is causing your symptoms. Asthma medications are classified as either for long-term control, or quick relief. Most are inhaled rather than taken in tablet or liquid form, to act directly on the airways where the breathing problems start. Asthma is a chronic lung disorder that can make breathing difficult. It causes inflammation, swelling, and narrowing of the airways (bronchial tubes). About 25 million people in the U.S have asthma; 7 million of those are children. 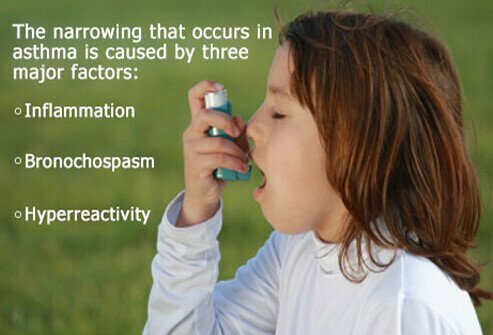 Asthma involves narrowing of the airways caused by three major factors: inflammation, bronchospasm, and hyperreactivity. Allergy plays a role in some, but not all, asthma patients. 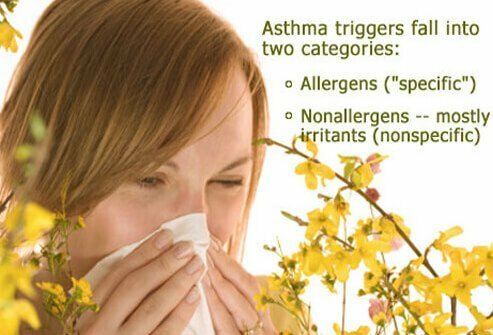 Allergens and irritants can cause asthma attacks. Asthma is diagnosed based physical exam, patient history, and confirmed with breathing tests. The best way to manage asthma is to try to avoid triggers such as allergens or irritants. 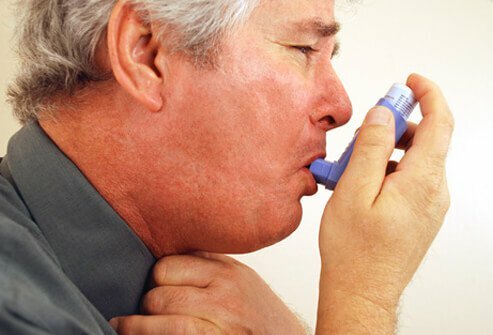 Medications can reverse or prevent bronchospasm in patients with asthma. 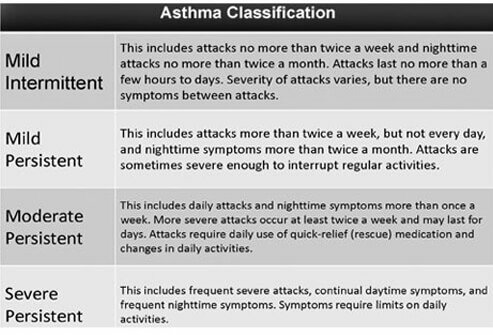 Asthma and Allergy Foundation of America (AAFA): "Adult Onset of Asthma." Harper, Douglas, PhD. “Asthma.” Online Etymology Dictionary. National Heart, Lung, and Blood Institute: "The National Asthma Education and Prevention Program." National Heart, Lung, and Blood Institute: "What Happens When You Breathe?" National Heart, Lung, and Blood Institute: "What Is Asthma?" National Institute of Health. “How Is Asthma Treated and Controlled?” Updated Aug 4, 2014. Nemours Center for Children's Health Media. “What’s the Difference Between a Nebulizer and an Inhaler?” Reviewed Jan 2014.